Russia did it. So did Africa. Even India pulled it off, along with London. Now, it's Chicago's turn to inspire a hefty new issue of Granta, the esteemed British literary journal which, when spied on a coffee table, seems to instantly confer upon the subscriber a mantle of elevated intellect, or at least the appearance of it. Founded by an enterprising group of Cambridge students back in 1889 (and named after the local river), Granta experienced its share of dicey times in the last century but has managed, since reinventing itself in 1979, to ignite admiration, ballyhoo and not a little envy. Privately funded by a megabucks Swedish philanthropist living in England, the journal places no restrictions on length for individual pieces, its contributors are well-paid and among the most sought-after international literary voices, and the requisite themes, like "Fathers," "Country Life," "Shrinks" and "Bad Company," to name a few, are amorphous enough to allow maximum flexibility. Lately, seismic upheavals in Granta's leadership have also generated scrutiny: in just two years, three separate editors assumed, then abandoned, the magazine's helm. But editor number four, John Freeman, hopes to steer for a good long haul. After becoming Granta's American editor in December 2008, he was promoted to "acting" editor of the entire shebang, whiplash-quick, a mere six months later. The 34-year old dynamo appears equal to the task -- accessible, enthusiastic and energetic -- all despite being obliged to shuttle monthly between Manhattan and London in a position that contrasts with Freeman's more sedentary life as a famously-prolific literary critic and president of National Book Critics Circle awards. Add "author" to that list: in October his first book, The Tyranny of E-mail, will be published by Scribner. But it's on September 14 that Granta 108, the first volume shaped completely by Freeman, will become available to the world. 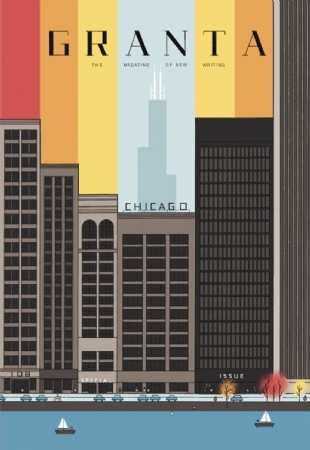 The Chicago issue crams 288 pages-worth of poems, essays, riffs and stories behind a cover illustrated by the city's own Chris Ware. Nearly all of the content was commissioned specifically for this issue, and many of the Chicago-based authors in the Table of Contents -- Aleksandar Hemon, Stuart Dybek, Sandra Cisneros, Alex Kotlowitz -- are certainly expected contributors. But there are plenty of surprises tucked among the 22 entries: Don DeLillo on Nelson Algren, a new poem by Anne Winters, an essay about Obama by Nigerian Nobel Laureate Wole Soyinka, plus a searing memoir by a previously-unpublished young author, Maria Venegas and an excerpt from Peter Carey's forthcoming novel, which does not take place on The Third Coast. How this issue came to be, and how it will be received "across the pond" were all on my mind when I caught up with John Freeman by phone after he touched down in New York. Why so hot on Chicago? Were any other cities aced out? It wasn't even close! It had to be Chicago, or we would have just turned to another theme. London was the only other city issue we did, 10 years ago, and it was our best-selling issue in British history. It would be nice if the same thing happened in America with the Chicago issue, but it will also be so interesting to our readers in England. Right now, Chicago is having a real cultural moment. There are so many good writers coming out of the city, and the city itself is evolving out of its industrial past, accepting new immigrants from many different parts of the world, so the heady mix of the city's population is changing too, and obviously Barack Obama is also a powerful symbol of that. But if Chicagoans read the issue and feel this is exactly what the city is like, that will be the toughest litmus test for me. I'm not from Chicago, so we relied on the writers to tell us the stories that mattered. I hope everyone feels it does the city justice, not as boosterism, but as a work of art. Were your British colleagues all on board, or did it require strong-arm tactics? It took a few months, and I have to say it was a bit like Chicago politics, requiring some wheedling, convincing and cajoling. They all know of the city, but mainly through its familiar mythology of the past, like Bellow and Dillinger, Sandburg and Capone. The Chicago of today is less familiar to them, which to me made it such a clear choice for the theme. I wanted very much not to be nostalgic or to belabor things about Chicago's past that are familiar. And once everyone was on board, it was so exciting to watch them fall in love with Chicago from afar. When Chris Ware's cover art came in, even I was overwhelmed, it's so beautiful. How daunting was it to secure that melange of contributors? It was tricky. We didn't have much time to make the issue, and certain people were left out simply because of time constraints, they couldn't make the deadline. There was also such a limited amount of space, at a certain point we couldn't have added a single piece, even if it came directly from God. That was frustrating, but since we ran out of space, we'll have tons of stuff on the web site granta.com, 20 additional pieces, and we'll publish one a day there, all free. But I don't think we could have possibly put together a better Chicago issue, and I'm very happy with how it turned out. Besides the luminaries, there's Maria Venegas, still a student and never published. Where did you find her? Part of our work at Granta is to visit colleges and universities, opening dialogues and offering discount subscriptions. We always invite everyone to submit, and in this case, we found Maria through that process. She's a student at Hunter College in New York, but came from Chicago, and her advisor, Colum McCann, said "check her out." Hers is a powerful piece of writing -- very incisive about violence and how it runs through a family. In commissioning these pieces, did you get what you expected? No, actually. We started with the idea for this issue, and then the writers wound up shaping it, some by turning in a piece that's different from what was asked for. But it's better for the writers to choose the direction of the piece. For instance, I had no idea Wole would write an important piece about Obama from the perspective he chose, or that Chicago writer Thom Jones -- who hasn't published for a while -- would produce a light and funny piece about working in a corn flake factory. And personally, I was so eager to get in a poem by Anne Winters, who I think is terrific. But she was the first we wrote to, then the very last we heard back from, only a day or two before going to press. Well, that was just something we decided to include. We had a chance to put it in, it's a fantastic book (titled Parrot & Olivier in America), so it does fit tangentially into the theme of the issue. But this is like the best piece of fiction we've ever run, a masterpiece, and I just wanted the issue to have the best writing. We'll always have a few pieces that break off a bit from the theme, and I figured if readers get tired of all the writing about Chicago, at the end they'll have this bonus. What's missing? Anything at all you wish you'd bagged? Yes: Barack Obama. He was the one person I wanted badly to include but who I never heard back from. I even tried through back channels, just to get even one, just one little paragraph! But the Memoirist-In-Chief has a lot on his plate. Hopefully he'll be able to read the issue and enjoy it. He's such a good writer, the kind that, were he not president, we would love to publish...me and several thousand other magazine editors.